Hide this Dealer (Jiani Associates)Discover properties by other dealers by hiding those whom you have already spoken to. You won't see them in your searches further but you can unhide anytime later. Hide this Dealer (Jayant Kawale) Discover properties by other dealers by hiding those whom you have already spoken to. You won't see them in your searches further but you can unhide anytime later. Supreme Pallacio, located in Pune, is a residential development by Supreme Universal. It offers spacious and skillfully designed 3BHK and 4BHK apartments. The project is well equipped with all the basic amenities to facilitate the needs of the residents. The site is in close proximity to various civic utilities. Where is Supreme Pallacio located? The project is located in Baner, Pune. What is the area of apartments in Supreme Pallacio? The area of apartments offered in the project ranges from 1750.0 sqft to 4250.0 sqft. 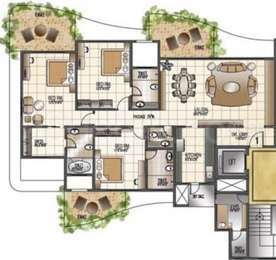 What is the area of 4 bhk in Supreme Pallacio? The size of 4BHK units in the project ranges from 2900.0 sqft to 4250.0 sqft. What is total size of Supreme Pallacio?The project is built over an area of 4.0 Acres. How much is price of 3bhk in Supreme Pallacio? The price of 3 BHK units in the project ranges from Rs. 24500000 to Rs. 28000000.
mbined together.Consistency and innovation are constantly associated with Supreme Developers, an ISO 9001 : 2000 certified company. The efficient workforce and professionalism speaks volumes about Supreme Builders as they have acquired a huge reserve of customer trust and faith.